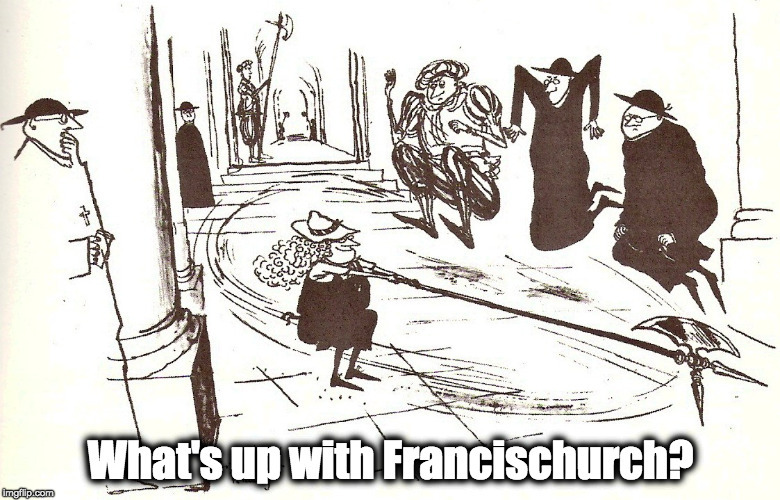 “Crucified cow” in a Belgian Catholic Church – not fake news – What's Up With Francis-Church? Yes, it’s in a still-consecrated Catholic Church. Yes, it’s real dead cow. Painted white. The shiny white surface in the foreground is a big pool of milk. The guy said it was about “modern wastefulness”. 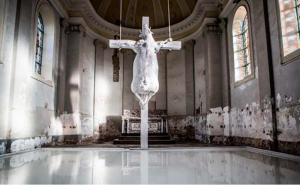 “The cow on the cross, surmounting a basin containing 5,000 litres of milk, is supposed to symbolize industrial breeding and thrown-away food. Visitors are welcomed with beef and cheese appetizers.” Of course there was absolutely no way to object to “modern wastefulness” except to create a blasphemous mockery of a crucifixion in a Catholic Church. Yep, Novusordoism’s banal, boring and narcissistic liturgical snoozefest strikes again. Some of these stories just take the stuffing out of you. They can make you feel legless and hopeless, as though there’s not even any point in protesting. I don’t know. Go sign the petition, I guess… I think after 20 years of this stuff, I’m kind of all outraged-out. This is in fact only one tiny little thing, a drop in the bucket of the incredible tsunami of blasphemous “art” – always directed at Catholicism’s iconography – intended to enervate and depress us. People are protesting it, I’ve seen some coverage in Italy too, but even a two minute sweep of Google news will uncover dozens a day in a similar vein. One of them was a “piece of performance art” that featured a naked man using a cheese grater to destroy a small statue of the Virgin Mary while people sat around and took selfies. What’s the point of it? To demoralize, and nothing else. The petition is here, for what good it will do. A bishop – Mgr. Patrick Hoogmartens – who thinks this is a good idea is already so far gone as to be obviously and ipso facto impervious to any complaints of sacrilege. But sign it anyway, because it’s a good thing to object out loud. But to stop the wholesale slide of the Catholic Church of Europe into outright satanism, I’d suggest offering a Rosary and doing a little fasting as being quite a bit more efficacious than an online petition. Also, let’s not forget what this kind of “art” is actually about, even on those increasingly rare occasions when it’s not a straight-up spitting in the face of the Catholic Church. And Mike has a few interesting additions here. But really, how much more do we really need to hear? Bishop Hoogmartens has expressed opposition to the blasphemous ‘crucified cow’, but he has not concretely acted to have the thing removed despite the fact that the church is under his jurisdiction. That is utterly despicable. When Dries Goethals, the president of the Catholic Forum, addressed the ‘artist’, Tom Herck, about speculations that he might be a member of a Freemasonic Lodge, he is said to have reacted obviously irritated. His ‘art’ is full of “Illuminati” symbolism, so I would be surprised if he were not a Freemason. Belgium has a long history of Freemasonry, and the Belgian State as it persists today was created by Nathan and James Rothschild in the 19th century through the Dictate of Calais. The first King of the Belgian State, Leopold I, was himself a Freemason and a friend of the Rothschilds. The satanism of Freemasonry is taking ever more control over the Belgian ecclesiastical province. An example is the fact that Kerknet, the semi-official website of communication for the Dutch-speaking Belgian Bishops, sells a book by the Jewish witch, Marina Abramovic, on its internet-shop page, who happens to drink blood in satanic rituals and has had ties to figures of the Clinton campaign. Hey, don’t have a cow man! Anyone up for a tennis match instead? It wasn’t even turned upside down. It just had the word “fountain” written on it. I can’t help making an analogy with the blasphemous Alexamenos graffito made in the 2nd century AD, made by a pagan who mocked a christian named Alexamenos representig him adoring a crucified Crist with a donkey’s head. In the next room the christian wrote his answer: Alexamenos fidelis (Alexamenos is faithful). I think this should also be our answer to these attacks on christianity. Yep….I’m kind of all ‘outraged out’ as well. Like the ‘artist’ who’s depicted ‘Christ crucified in a jar of urine’….or the Blessed Mother as a ‘prostitute’ and are calling it ‘ARTISTIC EXPRESSION.’ We’re being desensitized to the outrageous blasphemies going on within our own Church, or, eh….should I say the ‘Anti Church’. Of course, all of this must be in celebration of the 1917 exhibition of Marcel Duchamp’s famous ‘Fountain’ which was actually and obviously a men’s urinal turned upside down. And it has been mostly downhill ever since in the art world. Just another way to rip-off whitey. One would think the art buyer would tire of this sort of thing. But one would be wrong. Now even the Catholic Church has been taken in, or are willingly taking part, i in the self mockery which is modern art. Apparently milk bathing or milk baptisms are a form of satanic ritual. A lot of modern art like this is actually satanic. The mumbo jumbo “interpretation” they provide is obviously just a front to involve the public in what is obviously some kind of satanic ritual. Replacing Our Lord with an animal is also satanic and blasphemous. I look at it like this. In the Middle Ages the Church was on top, and the witches and druids were oppressed; now the witches and druids are back on top, and the Church is being oppressed. If nothing else, isn’t dumping 5000 liters of milk for an art installation ‘modern wastefulness’? The ironic stupidity is overwhelming. But the mosques are full, doncha know….. I dare this “artist” to install a pig sculpture inside a Flemish mosque, all in the name of social justice art.